The astable multivibrator, also known as a free-running multivibrator, is a circuit that produces a steady square wave without the need for external input. This square wave can be used as the clock source for a digital circuit. For the demonstration, the output is used to drive a pair of LEDs making a nice standalone light flasher project. The astable multivibrator example circuit here is built from two cross-coupled transistor switches. The transistors are connected via resistor capacitor circuits, which effectively tie the output of each transistor to the input at the base of the other transistor. The circuit has no stable state. When Q2 is high, capacitor C1 is discharging and C2 is charging. 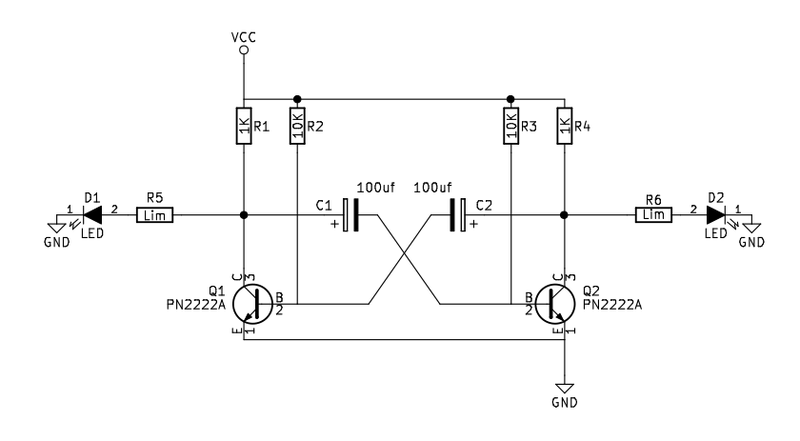 Once the charge on C2 is sufficient to bring transistor Q1 high, the process reverses. Q2 goes low, C1 begins charging and C2 begins discharging.